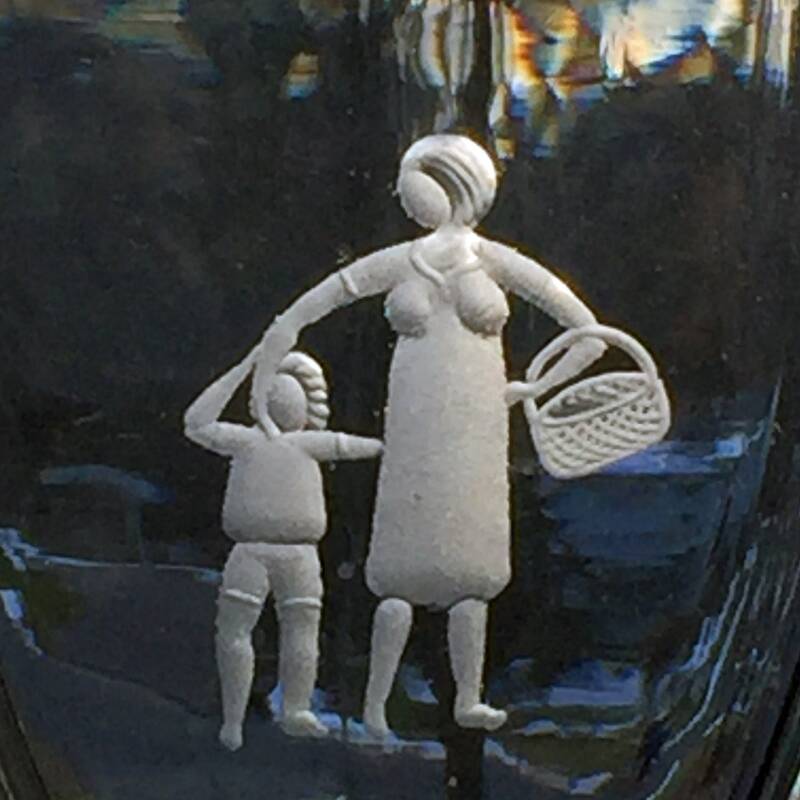 This is a lovely example of 1960's art glass from Strömbergshyttan, likely an Asta Strömberg design. 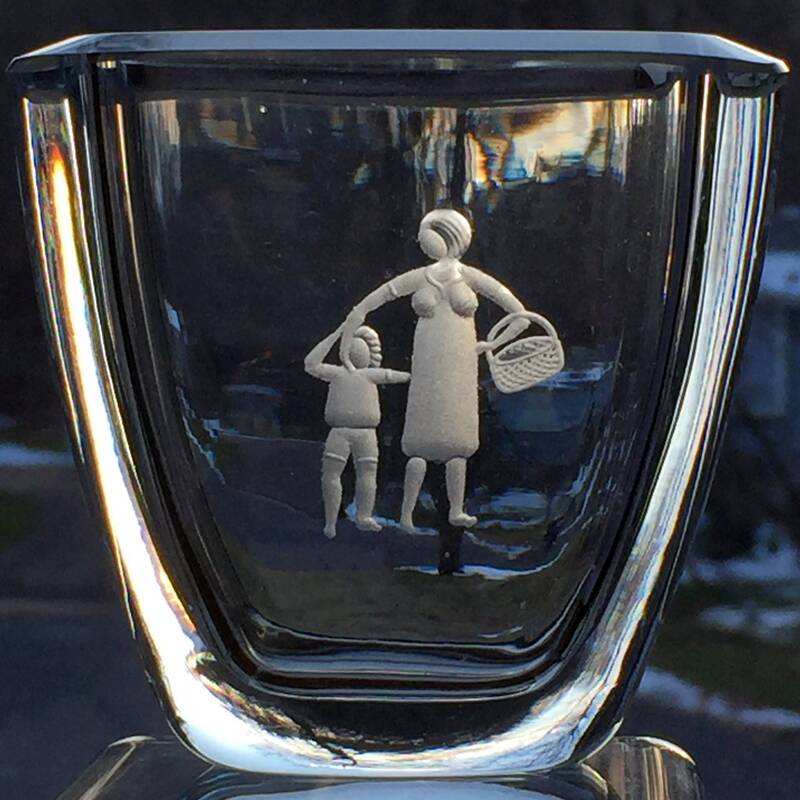 It is engraved with a touching motif of mother and child, walking arm in arm, as mother carries a shopping basket. 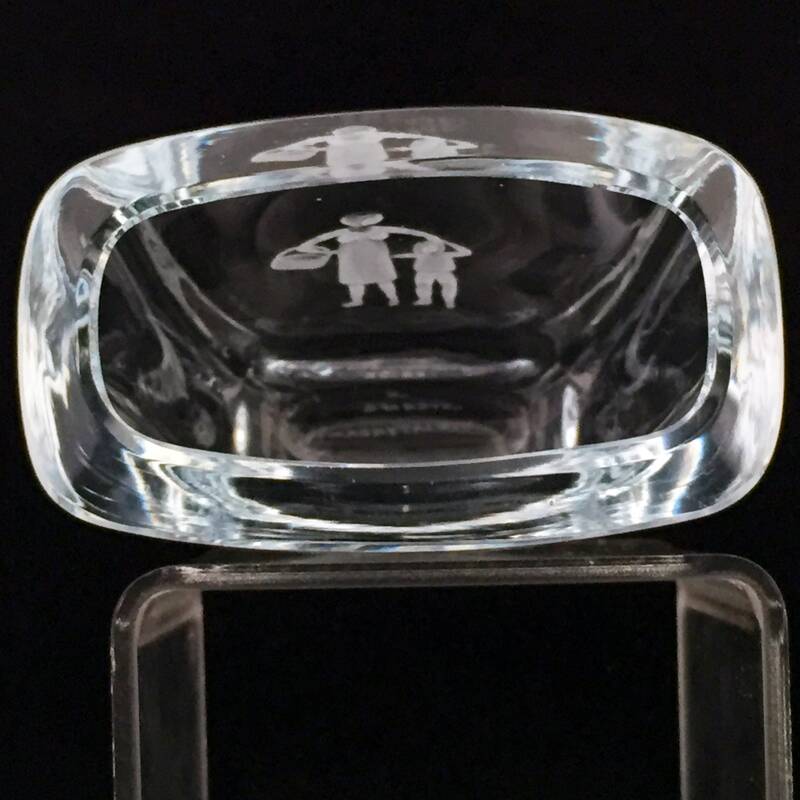 It captures an ordinary moment in a tiny work of art and craftsmanship. 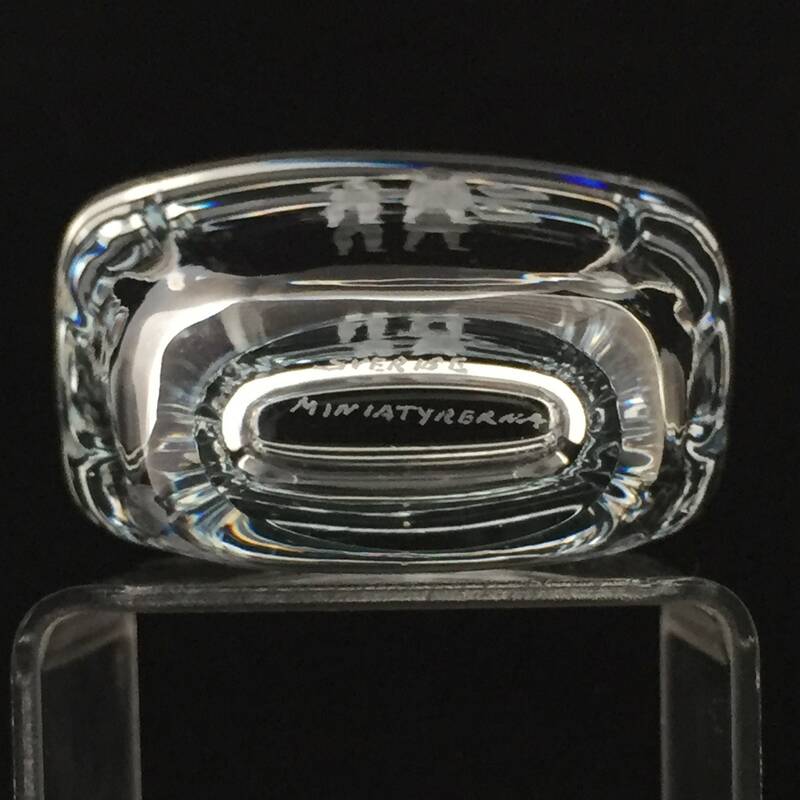 It is about 3" tall and 3.5" wide, and it is in excellent condition, clear and sparkling. The base is marked with "S Sverige Miniatyrerna" or "Strömberg Sweden Thumbnails." How charming! Here is a little of the story of Strömbergshyttan. In 1876, a glassworks called Lindfors ("winding falls") opened about 50 km west of Orrefors. In 1933, Edward Strömberg, who was a former head at Orrefors, and his wife Gerda, who was a designer at Eda, leased the company and changed the name to Strömbergshyttan ("Strömberg's hut"). 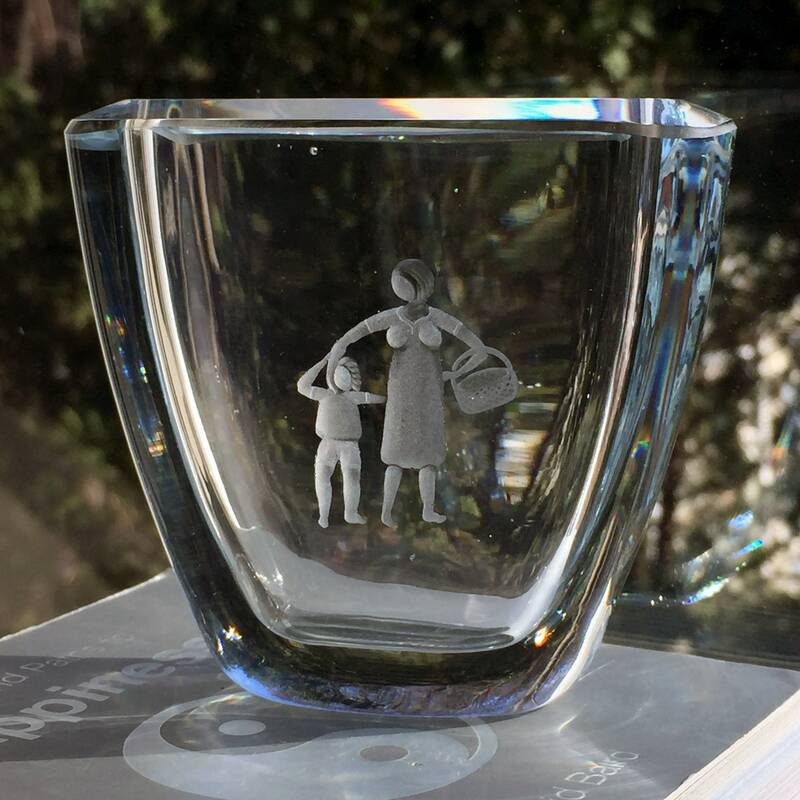 Edward and his son Eric devised a way to produce a glass that had a bluish-silver hue, which became characteristic for Strömbergshyttan. Eric Strömberg and his wife, Asta, bought the company in 1945, and they invested heavily to modernize it. The Strömberg family further upgraded the mill in 1960. 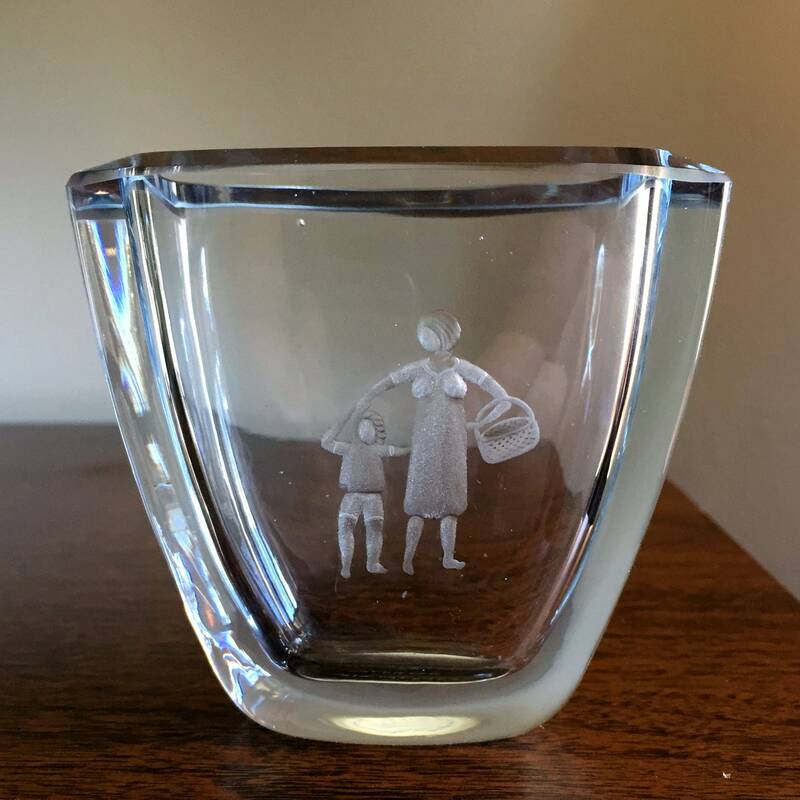 For most of the 40+ years that the family controlled the glass mill, Gerda and Asta Strömberg designed the glass. * In the 50s and 60s, the talented ceramic artist, Gunnar Nylund, also designed for Strömbergshyttan. A fire in 1973 left the glassworks in financial difficulties, and it was sold to Orrefors in 1976. Orrefors closed the Strömbergshyttan glassworks just three years later.